The Pole Dance Grip iTac2 is a wax grip enhancer that increases the friction of the hands on the pole. It reduces sliding and improves the stability and security of the dancer on the pole. 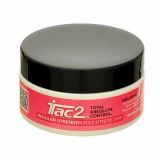 iTac2 is made with natural organic beeswax and therefore it is extra skin-friendly, and will not leave stains on the skin. iTac2 is long lasting, water repellant and works very well with sweaty hands. It is available in 2 different levels of strength. Which one is best for you depends on how sweaty your hands are and what you want to do on the pole.